SAN FRANCISCO, January 30, 2019 – Tubi (www.tubi.tv), the world’s largest ad-supported video on demand (VOD) service today announced record growth in 2018 and aggressive plans to expand in 2019. Over the past year, Tubi customers watched 4.3 times the amount of content on the service over the previous year – and in December alone streamed nearly as much content as all of 2017. Tubi was profitable in the fourth quarter of 2018 marking a major milestone and will reinvest the profits into additional content acquisitions in the coming year. This includes investing over nine figures to rapidly grow its already large catalog. Finally, revenue grew over 180% in 2018 – and in the fourth quarter alone, Tubi made more revenue than all of 2017 combined. 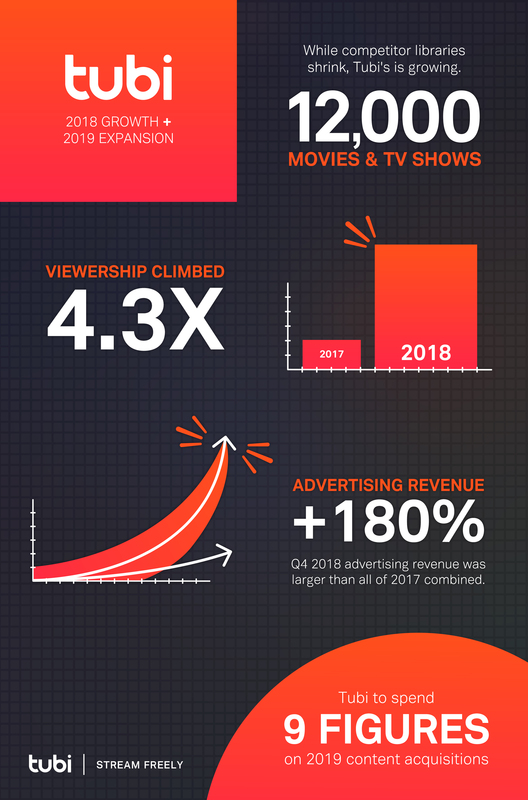 Graphic illustrating Tubi’s phenomenal 2018 and year ahead.